Skagway’s newest brewery turned on its taps this month. Its opening came during a conversation at the state level about rules for tasting rooms. “I came to Skagway specifically to brew beer,” said Joel Probst, one of Klondike’s brewers. He points to a hose emptying from a big silver tank into a white bucket full of bubbling brown liquid. 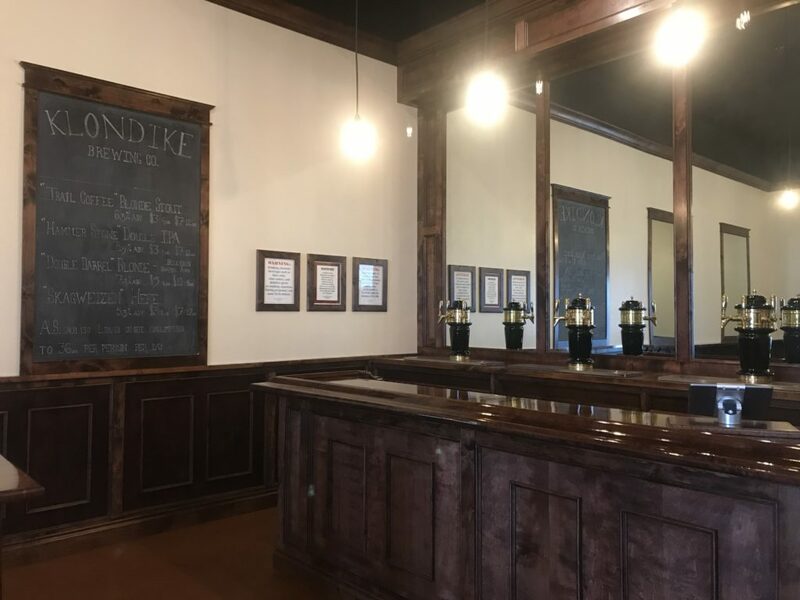 The Klondike Brewing Company opened May 1, the same day the first cruise ship of the season sailed into town. The room where beers are brewing is warm. The air smells sweet. “It’s almost like a candy shop for adults,” Probst said. There are four beers on draft right now. Probst sai the company plans to eventually sell their beers on tap at local bars and restaurants. Once the beer is ready to go, the brewers transport it through hoses to a refrigerated room across the hall. It’s basically a big, walk-in, refrigerator. Along with the finished beer waiting in tanks around the perimeter of the room, Probst stores various ingredients on shelves. There’s a lot of fruit puree. The main part of the brewery is the tasting room. A big chalkboard on the wall lists the beers currently on tap. Probst said the tasting room plays a critical role in the company’s finances. A bill reworking Title IV, that lays out state alcohol laws, was recently dropped for the current legislative session. That action comes after disagreements over an amendment introduced to Senate Bill 76, aimed at reducing the amount of product breweries and distilleries can sell as samples in tasting rooms. Klondike now is the second brewery in Skagway. And the town’s first distillery opened last summer. Probst, who came to Skagway specifically to brew beer, speaks highly of the community he’s landed in. And Klondike — now, they can brew it for you.